I had occasion to brag to Juan Cole today about my mother's jail term for civil rights, and about the letter Dr. Martin Luther King, Jr. sent to her for her trouble. 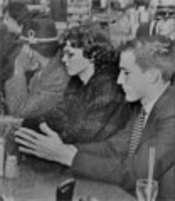 While she was a senior at a classy Virginia women's college, she tried to integrate a lunch counter in the first integrated sit-in in the South. Scandalous trial and jail term ensued, with much newspaper coverage and gnashing of white citizen teeth. You don't go telling a historian some long tale without looking to see if there is any historical record of it. I last googled my mother's civil rights activity more than two years ago, with little result; since then a book has gone online, edited by Rosemary Reuther, which describes Mom's actions in Lynchburg, VA, December 1960. Use the triangle "back" key by the page number to scroll to page 75, where the whole section on my Mom, Mary Edith Bentley, and her friend Rebecca Owen begins. The book reveals that it was not a letter but a telegram from Dr. King, and another from Robert F. Kennedy. I remember seeing the King document as a child, but it has gone missing since then. Also online are some pictures of Mom - she kept the original newspaper clippings in a scrap book I read multiple times in childhood, so these images are familiar to me. Go here to read about Rebecca Owen. Note the pictures at the top - my mother is the young white woman in the black cats-eye glasses, center frame in the first picture on the left and fourth picture from the left. I borrowed these images for my post - they are from the local Lynchburg newspaper. Rebecca Owen is the other white woman in the group photo next to my mom. She was a mentor of mine when I first moved to New York City in the early 1980s. Sadly, Rebecca died a few years ago after a long career as a psychotherapist. Happy Martin Luther King day, everybody. A wonderful legacy, indeed. I'm adding this link to a post I started last year which I plan to recycle annually on the occasion of the King holiday.